Ending the Waiting Game provides a well-documented portrayal of kidney transplantation in Canada from the perspective of an experienced kidney transplant patient highly active in organ donation initiatives. Kidney patients will be encouraged by the list of possibilities they can consider to reduce lengthy transplant wait times within the current system. They will also discover many positive ideas they can consider for advocating improvements to the Canadian organ transplant system. The book reveals the reality of the country's kidney transplantation structure, including a disheartening examination of waiting times, the characteristics and weaknesses of the various living and deceased organ donor programs and the inconsistencies and discrepancies from province-to-province within the present arrangement. The author also offers a thorough examination of the ground-breaking organ donation and transplantation successes from other countries, as well as a timely and relevant section depicting unfolding, innovative transplant medical advances. 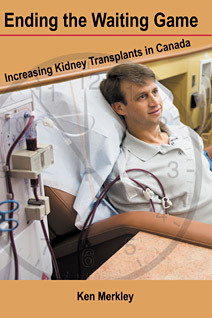 In addition to documented material from professional sources, the book contains a wealth of anecdotal information based on the writer's own experiences and the award-winning actions he has taken to improve organ donor and kidney transplant rates across the country. Patients with end stage renal failure will greatly benefit from the sense of empowerment and hope these experiences provide.